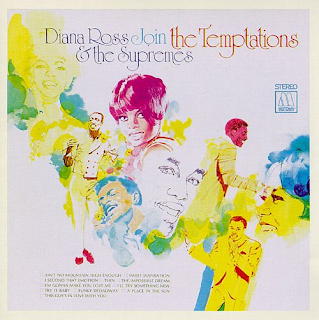 This was a fun, upbeat, joyful album collaboration between two of Motown's most successful singles groups - Diana Ross & The Supremes and The Temptations. The album was notable in that it marked the first appearance of Dennis Edwards on vocals for The Temptations, in place of David Ruffin. "Try It Baby" is a jazzy, lively piece of enjoyable fluff. It sounds much better in the album's stereo than on the single version, which was in mono. The voices are spread out by the stereo and the effect, and indeed the whole sound, is far superior, in my opinion. Indeed, for 1968, it is truly superb stereo. The massive hit single, Smokey Robinson's "I Second That Emotion" is wonderful, outdoing Robinson's original for verve and vitality. The vocals are simply superb on this. 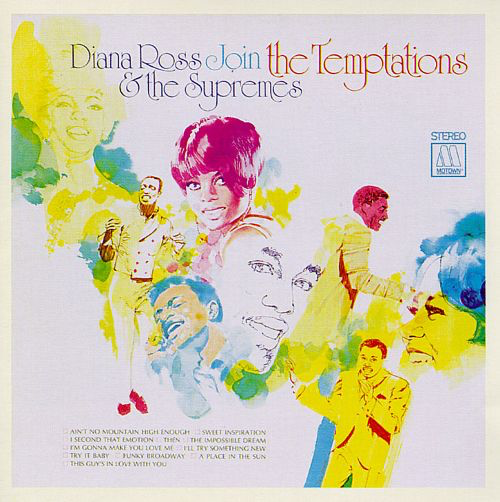 Diana Ross was never my favourite Motown female vocalist, (I always preferred Martha Reeves and Gladys Knight), but she is towering on this one. Their version of "Ain't No Mountain High Enough" is excellent, too. Again, I prefer it to Diana Ross's melodramatic famous recording of the song. The even bigger hit, the timeless "I'm Gonna Make You Love Me" keeps the quality coming. It is possibly the best of all the Motown collaborations. "This Guy's In Love With You" was an example of Motown's tendency to go a bit "cabaret" on albums, with a cover of Burt Bacharach and Hal David's "easy listening" classic. They do it pleasantly enough though. The track fades in to the fuzz guitar of "Funky Broadway" and The Temptations cook up a funky recipe that is probably the most credible on the album. Even Diana Ross manages to strut her funky stuff. Smokey Robinson's "I'll Try Something New" is both punchy and delicious. Stevie Wonder's "A Place In The Sun" has a big, bassy backing and Diana Ross's lead vocal handles the song beautifully. "Sweet Inspiration" is a rhythmic, gospelly number. The quality on this album has been surprisingly good. One may have expected it to be just the two big hits and some schmaltzy cover versions, but it has not been the case. "Then" is a forgotten corker of a song. Recorded in the mid-sixties by The Four Tops, the lads and lassies breathe new life into it. Apparently, it had been originally intended as a single. It would have been a good one. Diana Ross suits the diva-esque show song glamour of "The Impossible Dream" down to the ground. This sort of song was often put on to albums like this to lure "adult" record buyers as well as pop-loving teenagers. It is delivered perfectly, but it does seem a bit incongruous amongst all the Motown majesty of earlier.